Finally Sony appear to have listened to the end users who desperately need a wide angle servo zoom lens for the FS5 and the FS7. The original lens of this type is quoted as a full frame /ASP-C lens while this new lens is being touted as an APS-C lens only ? Offering film makers a powerful new creative tool, Sony has developed an advanced Super 35mm / APS-C format power zoom lens that starts at 18mm wide angle and extends to 110mm at the telephoto end (27mm – 165mm equiv. in 35mm format[ii]). The new lens has a 6.1x high zoom ratio, even with inner focus, and maintains a constant F4 maximum aperture throughout its zoom range for beautiful depth of field effects and stable exposure control. Optimum optical performance and operability is complimented by a dust and moisture-resistant designi, making the lens ideal for location use. Extra versatility is afforded by Optical SteadyShot technology that provides in-lens image stabilization during handheld shooting. The lens also features a compact and lightweight[iv] design making it a truly mobile solution. Additional flexibility is afforded when used with the SEL14TC and SEL20TC teleconverters for 1.4x and 2.0x extension of focal range. The E PZ 18-110mm F4 G OSS Super 35mm / APS-C power zoom lens for professional movie-makers and photographers will available in North America from November 2016, priced at approximately $3,500 US / $4,500 CA. Note : CVP have this lens priced at £4,088 ??? 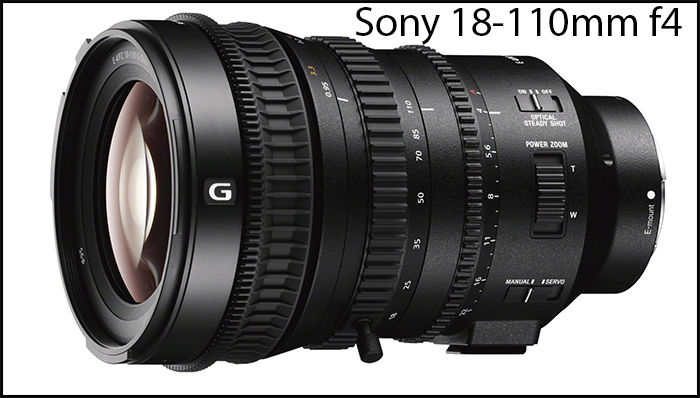 Hands On With Sony 18-110mm F/4 from cinema5D on Vimeo. Every Sony FAN BOY wanted this zoom lens and here we are, no response ! and this el cheepo Sony.